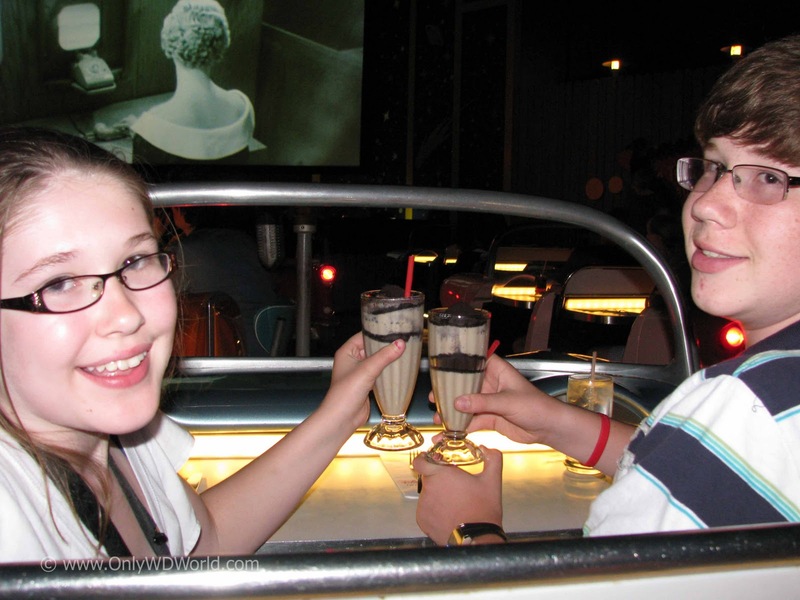 Disney World is known for amazing shows, outstanding quality, and delicious food. All of these key elements come together to create Disney’s Sci-Fi Dine In Theater Restaurant in Disney’s Hollywood Studios. 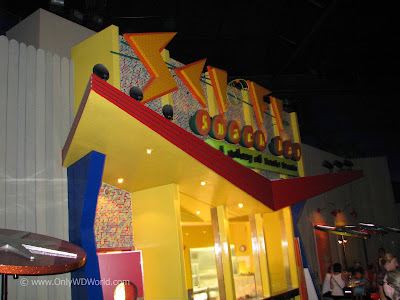 Located near the sign-ups for American Idol and the back of Star Tours is the Sci-Fi Dine In Theater. 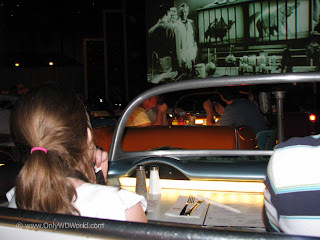 This amazing restaurant has one of the best restaurant themes in Walt Disney World. 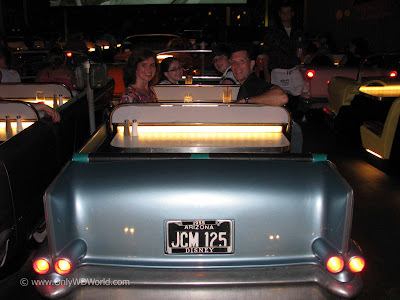 You are taken back to the 50’s and are in a giant outdoor theater watching classic sci-fi’s from the 50’s on a giant projector in your family’s own classic car. To your right and to your left are the sparkling city lights. Even the most serious adults will laugh at the somewhat corny movies. As you head inside the waiting room for this fabulous restaurant, the Disney Host at the check-in will give you two choices of seating: the flying saucer, a picnic table with a “saucer” as an umbrella, or a car. I highly suggest the car, although the wait might be slightly longer. The car is separated into 3 rows so the kids can sit in the back and the adults in the front (or vice versa), but don’t worry you can still easily see and talk to each other while enjoying the movie fun! Every now and then if you look back you may be surprised to find a hitchhiker in your car! Don’t be worried though, it’s just another person who’s come to enjoy the sci-fi fun. Kids will love the amazing milkshakes, that if I may say so myself, are “out of this world!” If you have trouble deciding on a flavor, I suggest the cookies and cream. With all of the funny movies you may not even find time for eating! If you do though, you should try the Rueben. It’s amazing! Make sure that you get some fries and load up on the ketchup and enjoy the movie magic. One thing that you won’t find at this movie is popcorn, but that is all right because the food is so good you don’t need it. I highly recommend this fun, tasty, and downright amazing restaurant. It is an excellent place for family and kids, our two adults ready for dinner and a movie! 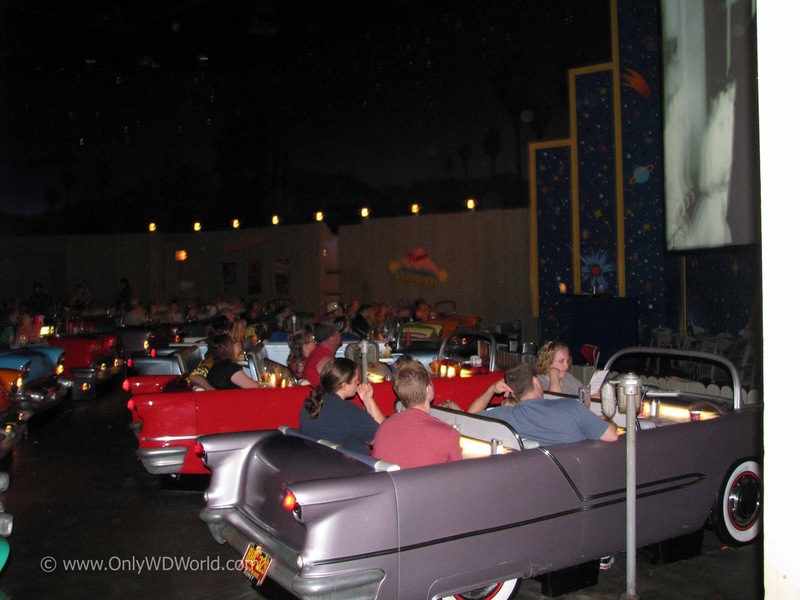 So the next time you’re at Hollywood Studios make sure that you stop by the Sci-Fi Dine In Theater! 0 comments to "Disney World Teen Reviews: Sci-Fi Dine In Theater"